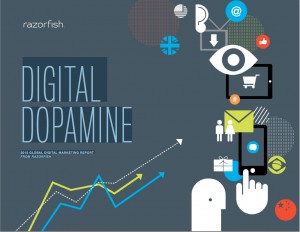 If you haven’t checked out the new report by Razorfish: DIGITAL DOPAMINE: 2015 GLOBAL DIGITAL MARKETING REPORT, you may want to check it out sooner rather than later. And I’m not just saying that because I’m in it! (The report contains a one page interview I did with one of their staff — page 29). It’s an interesting report based on a survey of 1600 millennials and gen-exers from the US, UK, Brazil, and China, as well as some in-depth interviews. My favorite point is this one: “Seventy-six percent of people in the U.S., 72% in the U.K. and 73% in Brazil say they are more excited when their online purchases arrive in the mail than when they buy things in store.” I have heard the same comments in my behavioral science research. And the reason has to do with the anticipatory centers of the brain. I wrote about this recently in my report “Why You Should Do Behavioral Science Research At Least Once This Year”. The Razorfish report is comprehensive. I think it’s worthy reading if you design or produce digital products, marketing or advertising. And don’t forget to check out page 29! What do you think? Does any of this data surprise you?